Since 1961, Aguila has produced some of the best rimfire ammunition in the world and is the primary producer of ammunition for the Mexican military. Originally a manufacturing plant for Remington and now distributed by Texas Armament and Technology, Aguila continues to produce a wide variety of rimfire, centerfire and shot gun ammunition. 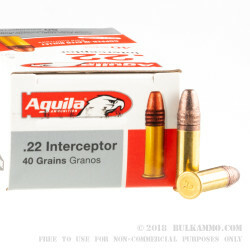 Made for various applications, from law enforcement to sport shooting, Aguila manufactures all their ammunition from their plant in Cuernavaca, Morelos, Mexico. 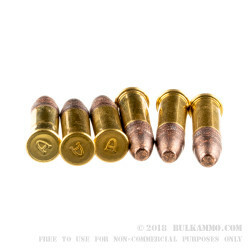 Aguila’s .22 Interceptor long rifle rounds are loaded with a 40-grain copper plated round nose projectile, into Eley primed rimfire brass cases. 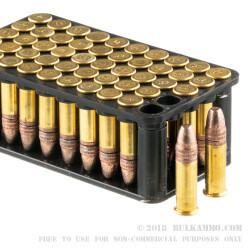 These quick moving rounds are capable of a muzzle velocity of 1470 FPS and are made to be accurate even over long ranges. 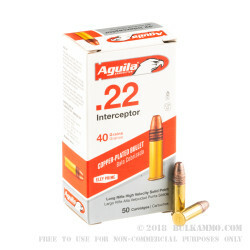 Great ammunition for plinking, target practice or hunting, the Aguila .22 Interceptor is a versatile rimfire cartridge and comes 50 rounds to a box.